In separate bowl, whisk next four ingredients until smooth. Gently stir into mashed avocado and blend well; add shrimp and onion. Prepare Sugar-Pepper by mixing salt, black pepper, red pepper, and sugar. Add gradually to taste, to avocado mixture, adjust seasoning, reserving some sugar-pepper for topping guacamole if desired. Transfer to serving bowl, garnish as desired. 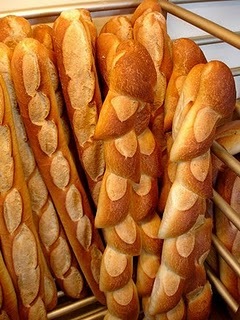 Enjoy as spread for baguette slices. In This Week's Appetizing News, we wish to offer our humble congratulations to the New Orleans Saints, for their Super Bowl XLIV victory last Sunday! we love our French tour merchants and, our fans in France (hence the baguettes)! With great pride and joy, Di offers her New Orleans-inspired guacamole recipe. It was originally developed for the Chilean Avocado Board, in 2004 for the Sugar Bowl game. Served with toasted baguette slices, admittedly it seems quite strange and unusual ... until you get a taste and, can't stop eating it! Try it for a Mardi Gras celebration or anytime you have occasion for boasting a fantastic new appetizer! Just enjoy! On behalf of my lovely sister Lisa, you are wished delicious hours around the table this week, especially with those you love!